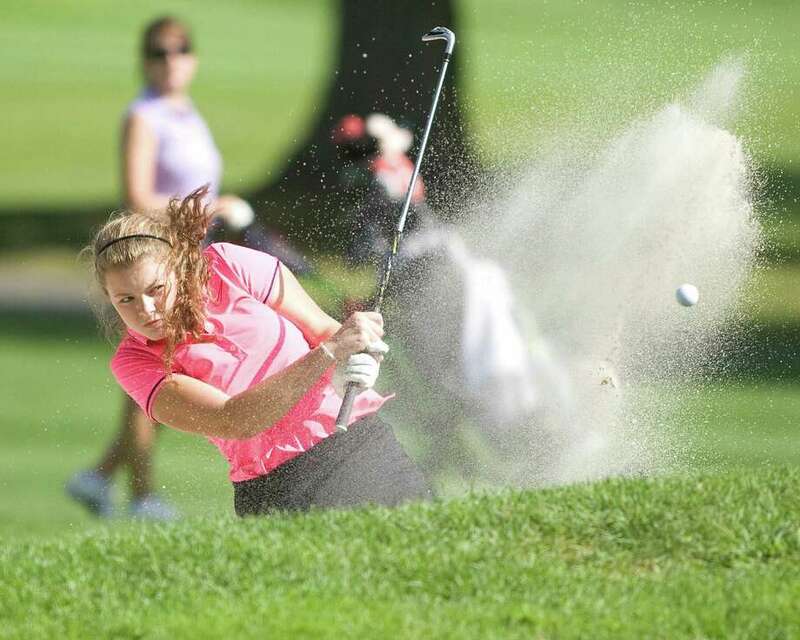 Sam Steichen, 17, of Danbury blasts out of a sand trap during play in the Fran McCarthy Junior Golf Tournament Tuesday at Richter Park Golf Course in Danbury. DANBURY -- Richter Park's L-shaped opening Par 4 dog-legs right into trouble for the wayward lefty, particularly those with the distance to reach the encroaching tip of West Lake Reservoir. Before he could praise the Richter layout for its postcard scenery, one such southpaw, Norwalk's Jacob Henny, began his title defense at Tuesday's Fran McCarthy Junior Championship with too close a look. "I hit my first tee shot into the water and made a bogey," said Henny, 16, a rising senior at St. Luke's School in New Canaan. "And then on (the par 5 second) I was on in two and three-putted for par. So, not the ideal start." The finish -- a sparkling 2-under-par 70 highlighted by a near-ace on the 152-yard Par 3 17th -- was more to Henny's liking, and it helped him retain the crown by a comfy nine strokes over Jacob Meisel, the second-place finisher from Westport. The annual late-summer event drew 95 young golfers hailing from all over Fairfield County and from across the Empire State border. Henny, who broke through last year with a sudden-death victory after falling in a playoff in 2010, has now played the tournament eight times, with an eye on a ninth -- and a three-peat -- in 2013. "The course itself is great," said Henny, who came back to birdie the third, par the next 11 holes and finish with a 2-under-par flourish. "Especially, you have holes 3, 5 and 12, which are all on the reservoir, so it's really picturesque, very scenic. And this is a very well-run event. It's a lot of fun." History was made in the girls championship, which 12-year-old Lauren Peter, of Carmel, N.Y., won with an 8-over-par 80. Never in the 14-year history of the tournament had a golfer not yet 13-years old topped the field in the 13-17 division. Rarely are they entered. Peter bested reigning champion Lauren Bacigalupi, 17, of Southbury, by seven strokes. "I had three birdies and my approach shots were very good," said Peter. Johnny Mould, 6, of Greenwich, captured the boys 5-8 division with a five-hole total of 30. Danbury's Cassandra Plank-Pinho, 7, won the girls title with a score of 33. Joshua Bloom, of Yorktown, N.Y., won a showdown of 12-year-olds in the boys 9-12 group, shooting a 47 over nine holes to edge Stamford's Colin Callahan by two strokes. Bloom shot a 63 in last year's event. The girls 9-12 division was even tighter, with Danbury's Oona Fury, 11, and Greenwich's Sydney Netherlott, 11, sharing the crown with matching 59s, one shot ahead of Danbury 12-year-old Payton Dorsch.